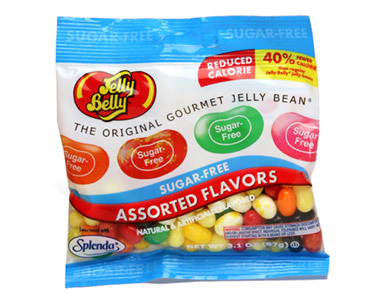 Jelly Belly Sugar-Free jelly beans in a 2.8 oz bag. Assorted flavors like Buttered Popcorn, Very Cherry and more. Sweetened with SPLENDA®. Have Jelly Belly beans without the sugar. Included are ten of our most popular flavors: Very Cherry, Tangerine, Green Apple, Juicy Pear, Licorice and others. All sugar-free jelly beans by Jelly Belly are certified OU Kosher by the Orthodox Union.